THE FILM PATROL: ‘Fight Church’ review: in the name of the father? Wide-ranging discussion of film topics, mainstream and obscure, as well as humorous commentary. Your projectionist: Brad Weismann. ‘Fight Church’ review: in the name of the father? "Can you love your neighbor as yourself and at the same time knee him in the face as hard as you can?" The topic is the all-too-real recent upsurge of evangelical Christian churches and ministries that feature mixed-martial-arts clubs and training programs for young men (and a few hardy young women), and the stepping of young and enthusiastic pastors into the ring – in this case, cage. The stated impulse behind this intersection of sport combat and spirituality is to teach Christian qualities such as courage, endurance, the ability to bear pain, and the like – as well as the ever-present opportunity to witness and recruit for Christ in the seemingly unsavory arenas and auditoriums where audiences cry out for blood. However, co-directors Daniel Junge and Bryan Storkel don’t take the easy path of condescendingly condemning or poking fun at the men behind this trend. More disturbingly, they take a handful of subjects and take them seriously, follow them open-mindedly, let them express themselves fully, and let the camera record emotional subtleties and contradictions that alternately undermine and bolster their assertions. The protagonists whose stories we follow include Paul Burress of Rochester, NY; Preston Hocker of Norfolk, VA; John Renken of Clarksville, TN; Nahshon Nicks of Jacksonville, FL; and Scott “Bam Bam” Sullivan of Houston. All these men talk openly about dedication to their faith and its relation to their enthusiasm for MMA fighting, and there is much dialogue about ensuring that the message that Jesus is for men, not just women and children, and concern about the “feminization” of the culture, that a warrior ethos might serve as a corrective. However, a subtext that audiences pick up on and the directors say they keyed into as the editing progressed is the theme of fathers and sons, the need to prove oneself to an expectant/demanding father, or to compensate for a lack of one. The constant urge to man up, the mantra that “Jesus never gave up, never ‘tapped out’” resonates as we see these guys train, struggle, lose, or win. The sense of identity this discipline instills is palpable, and so is the camaraderie of the training room, gym, and arena. Why are men compelled to be tough? Why is conflict the accepted route to self-esteem? 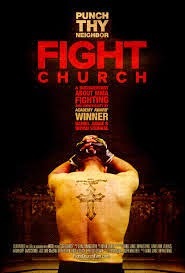 “Fight Church” doesn’t tell us, but it shows us. As the film progresses, we see Renken rant, watch Hocker and Nicks clash, “pastor vs. pastor”; witness Sullivan reject the sport as inconsistent with his Christian values. We meet the other side of the MMA debate in the form of an eloquent priest and a recalcitrant New York legislator. We see the ambiguity and concern, not triumph, on Nicks’ face after a victory. And we see Burress’ validation and redemption after he overcomes his wife’s concerns and steps back under the bright lights, facing an opponent head-on. In other words, “Fight Church” gives us no easy out and refuses to make up our minds for us. Good job! If I would have any caveats, it would be on two points. First, it seems that all matches and press opportunities include women in blatantly scanty attire, which no one on or behind the camera questions – a telling point in and of itself. Camouflage bikinis? That’s probably a documentary all by itself. Secondly, the directors acknowledged that presentations of the fights themselves were extended via multiple camera angles, slo-mo, and editing to make them more intense and seemingly longer. “When the fights are 43 seconds long, you have to do something,” Storkel stated. Additionally, both Junge and Storkel discussed the extensive “punching up” (no pun intended) of sound effects that sound designer Lawrence Everson added to the fights, describing it as the most augmentation they’d had to do yet on a film. I wonder what kind of perspective seeing the raw footage, brief and less concussive, might have brought to the story. If the narrative demands dictate that the actual action of “Fight Church” be blown up into more steroidal dimensions, what does THAT say about the culture’s inescapable need to cast our macho impulses into a heroic light – whether it’s appropriate or not? "Fight Church" is set for release on Netflix in October.